From "...Friends" to TBS's previous release, "Louder Now" the band has gradually evolved, and "New Again" seems to be just another step of natural progression in that evolution. The band's sound has been changing, though sometimes only slightly through each album, and refining itself into what it has become and is presented as on their latest release. "New Again" starts with the title track's prompting the listener in with an addictive bassline that sets the mood for the album with a pounding beat representative of the more blatant "rock" sound that carries through the rest of the album, an element that has been far more subtle in past TBS releases. The band seemed to attack their instruments and dive straight into the sound without looking back for this release. Fans of simplicity may be taken aback by the "big" sound TBS have mastered in their own unique way for "New...". Even slower songs ("Where my Mouth Is" |"Everything Must Go") eventually build and absolutely thrash the listener with musical intensity. Whereas, previously Taking Back Sunday have been known for their infamous shrieking dual-vocals, this release may very well define them as musical "dynamicists." Yes, I did just have to make up a word for that. So, where has all the shrieking gone? Oh, it's still there, but used sparingly and where it is needed for emphasis. The dual-vocals that TBS fans have grown to love are hardly noticeable and relatively rare, but what is also hardly-noticeable is the fact that they are absent; as, new guitarist Matt Fazzi's and lead singer Adam Lazzara's voices mesh harmoniously. As different as the "New Again" vocal styles may be, they still maintain the same sing-along, catchy melodies that fans love. As far as lyrics go, Lazzara has explained in recent interviews that the words penned for "New..." are more personal than ever, and- with a few close listens- fans will find this very apparent. -"Cut me Up Jenny" : To make you sing along on the first listen. -"Carpathia" : This is the closest thing you will get to Adam Lazzara rapping. -"Everything Must Go" : To feel. To make your chest absolutely explode. 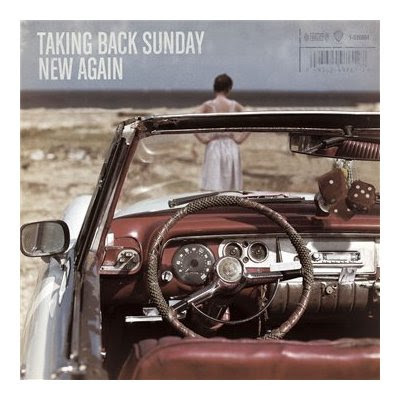 With "New Again", Taking Back Sunday have refined a sound and made it more their own than ever. Go to TBS's Myspace to hear the entire streaming album for yourself, and let me know what you think! Also, check out my review of their recent show which was featured on the band's Myspace and on their main site! :} Neither can I! Thank you for reading! Hey great review. I've been listening to the album all day. I was a little surprised they released it online before Tuesday, but I'm not complaining anymore. I like what I'm hearing so far. You nailed it when you mentioned the "rock" sound. I'm seeing them June 27th in Boston...can't wait. Now I only have to wait for Brand New to catch up. ^ Thanks for reading, Greg! And thanks for following my blog! You are definitely in for a treat seeing them. Their show I attended in Cincinnati was among my best concert experiences. ... Did you just mention Brand New and TBS in the same comment? Oh man, I'm going to sit here and stare at your comment until the two Band Names start fighting their way through the pixels to get to one another. Ha-ha! Just Kidding. I'm totally into Brand New as well, and am way stoked for whatever they have in store. TBS has been my favorite band since Tell all your Friends and i listen to them avidly. While i do not dislike the album (i like it alot), i REAALLYY miss the dual vocals. I mean, to me that what Taking Back Sunday is. Great Album. Slightly Disappointed. Yea, Anon. I totally miss them too. I was listening to TAYF today and was like, God-- that's good. LOL! It's kind of bumming that it was a definitive element in the music that is kind of gone, but I like their new direction as well. Well written and I applaud you. TBS is just going to have to hire you as their publicist I think hun! Anyway,nice job, Congrats! Oh, golly me, Val! I wish! I have listened to New Again 24/7 over the past week trying to convince myself that I love it. I don't. Let me say--I consider TBS my favorite band. But Tell All Your Friends and Where You Want to Be are the reason I love them. In fact, I don't know any TBS fans who jumped on board after Louder Now. In other words, I believe their fans became fans because of the music in the earlier years of their career. That crescendo-building that they are so good at is simply missing on Louder Now and New Again. I blame this on three factors: the band has matured (and changed members), the music scene has changed, and they're on a major now. Like you said, Cassie, TBS can make you feel, can make your chest absolutely explode. It's really an indescribable reaction. And that is why Everything Must Go is such a tease. Despite the musical climate, the maturity of the band, and the fact that they're on WB, they STILL have it in them to write and deliver gut-wrenching, passionate music. The radio-friendly pop rock that makes up so much of Louder Now and New Again simply doesn't invoke those same feelings. I'm disappointed even though I was expecting New Again to sound similar to how it does. And since someone brought up Brand New (despite the bands' personal feelings, does anyone really only like one band and not the other? ), I have to say that I've been more impressed with their progression as artists than TBS's. Each album is different from the previous, but it's still exciting--Brand New still make you feel. Great point. Even though the lyrics seem much more personal to specific band members on "New Again" the ambiguity that lyrics of the other albums had is quite missing, and it is what helped me relate the songs to myself personally and really feel them. I feel like "New Again" is less of a feeling album, and more of a fun one. I don't think it's really even comparable to the older albums, because it's so different. I know what you mean about Brand New. They have made DRASTIC changes, whereas; Taking Back Sunday's have been subtle, and -for some- detrimental. Thank you for your opinion; I'm glad to finally see some variation! Over at Phrequency.com we have a huge gallery featuring TBS' recent show at the Electric Factory in Philadelphia. In addition there are a number of photos of Anberlin and Envy on the Coast playing to the packed crowd. Phrequency is a music website that covers everything going on, national or local acts, nightlife, and more in Philadelphia. It rules, seriously. capital M.E is brilliant, can feel the feelings the band felt with the departure of tom was it? It's definitely a very charged song and one that has grown on me.